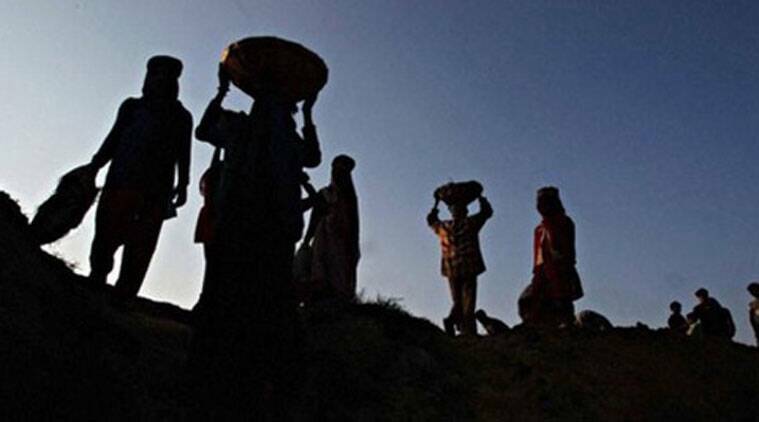 In 2014-15, the first year under of the NDA government when Prime Minister Narendra Modi had dismissed MGNREGA as “the living monument of UPA’s failure’, the person-days generated was just 166 crore. Under the scheme, the unit of one person-day is generally taken to be eight hours of work. On March 18, the ministry announced the provision of 150 days of work in most districts of Jharkhand and Karnataka. While government officials implementing the scheme attribute the spurt to the increase in the frequency of climate-change related incidents such as drought or floods that lead to a loss of the mainstay farm incomes, those monitoring the scheme on the ground state that the increased uptake of MGNREGA work also reflects the overall situation of unemployment. MGNREGA is a demand-driven social security scheme that provides for 100 days of work per rural household with the number of work-days allowed to be increased to 150 annually in case of drought, flood or a similar calamity. Nikhil Dey from the Mazdoor Kishan Shakti Sangathan (MKSS) pointed out that in the face of unemployment and drought, people will take up any job that opens up. 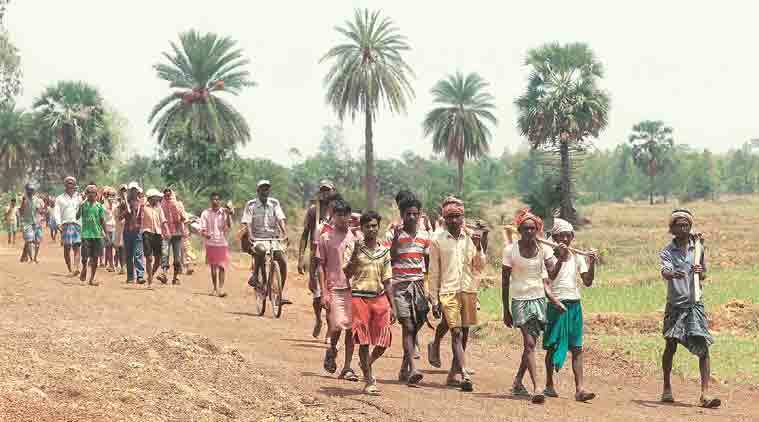 “Owing to joblessness, there is a massive demand for MGNREGA work but the provision of work was often restricted due to inadequate funds being allotted for the scheme by the Finance Ministry. The recent increase in person-days reflects that the government has finally acknowledged this demand,” he said. 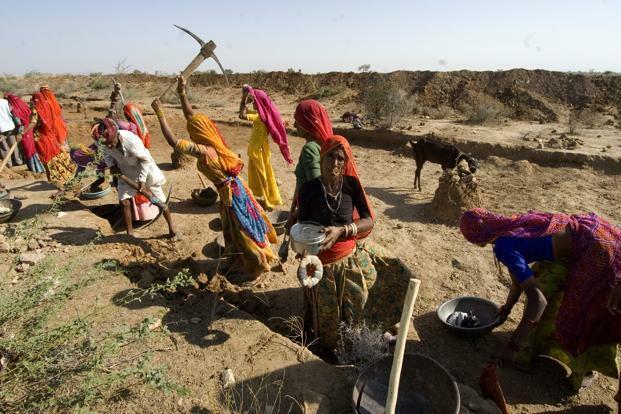 As per Rural Development Ministry estimates, in recent years, almost a quarter of the districts in the country have declared drought leading to a subsequent increase in demand for MGNREGA jobs. On March 18, the ministry announced the provision of 150 days of work in most districts of Jharkhand and Karnataka. 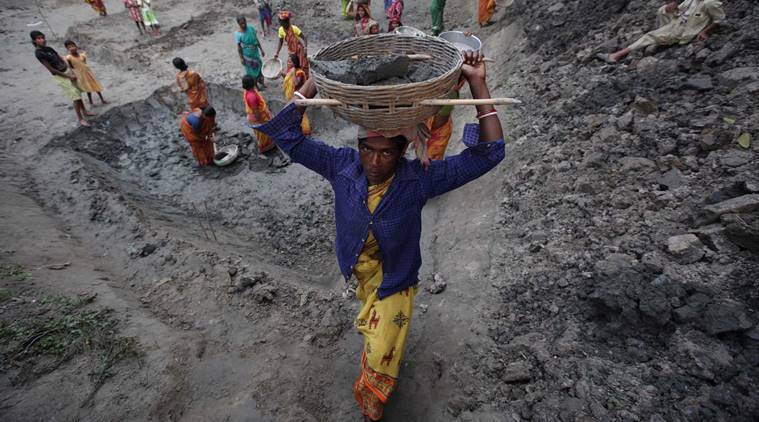 While MGNREGA provides for 100 days of work and 150 days in conditions of drought, data show that the average days of employment provided per household in 2018-19 while marginally higher than last few years is still only 49 days a year. 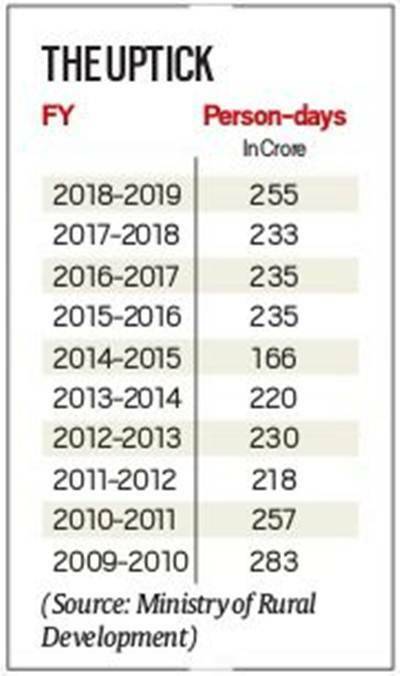 The last time the MGNREGA work provision had peaked was in 2009-10 under the UPA-II government when owing to an unprecedented severe drought, 283 crore person-days work was generated under the scheme.